Local jazz presenter José DaCosta and Exodus to Jazz are bringing vocalist-bassist Kate Davis and her trio to Rochester on Saturday, May 7, 2011, 8:00 pm at the Lutheran Church of the Reformation. Davis will be joined by pianist Noah Kellman and drummer Jake Goldbass accompany to close the current Exodus To Jazz season. A rising star on the national and international jazz scene, Kate Davis is one of growing number of talented female bass players who sing (both on the wider jazz scene and our own local version). Kate Davis began achieving national recognition for her bass and vocal skills while in high school in Portland, Oregon. She was named a National Foundation for Advancement in the Arts "youngARTS" Silver winner, is a four-time Downbeat Magazine Student Award winner, a two-time participant in the Brubeck Summer Jazz Colony, and was bassist in the Grammy Jazz Ensemble. She was selected as a 2009 Presidential Scholar of the Arts, which included a White House visit and a performance at Kennedy Center (YouTube video). Since moving to in New York, Kate has performed at Lincoln Center’s Dizzy's Club Coca Cola and The Blue Note. Local artist Miché Fambro opens the concert with his unique combination of guitar playing and singing that fuses elements of flamenco, jazz, classical, pop and soul. Doors open at 7:00 pm. The Lutheran Church of the Reformation is located at 111 N. Chestnut St. in downtown Rochester. Parking is available in the lot next to the Church. Tickets are available at all Wegmans stores That's the Ticket outlets and online at BrownPaperTickets.com. 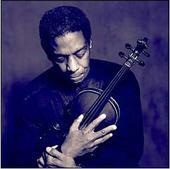 For more information about the concert, visit the Exodus to Jazz website or call (585) 733-7685. Was nice to finally get into the Bug Jar for the MOPDTK show last week along with the music of Rochester's own Bending & Breaking (including the ditty Nobody Reads Your Blog, which they assured the crowd DID NOT refer to Jazz@Rochester, although I wouldn't be sure about that...) and the Motown and soul sounds of Bitchin' Kitchen. It was great to see a lot of folks, coming out of several different generations old and young, coming out to hear compelling and new jazz music that defies categorization (although I think there were a lot there to hear the Kitchen.... they didn't all leave when their set ended). Now I'll have to get out there to see something that fits their usual musical palette sometime soon. This coming 7 days brings mostly local jazz, although guitarist Mary Halvorsen, whose album Saturn Sings has received a lot of critical praise, joins the Tom Rainey Trio presented by Bop Arts on Tuesday. By the way if you know of anyone coming into town over the next few months (other than the jazz fest of course), let me know so I can add it to the look ahead listings at the end of this post. Hope to see you out there! We've compiled these listings from information obtained from the performing artists themselves and other sources. The aim is to give you a one stop place to find all your jazz in Rochester.The aim is to give you a one stop place to find all your jazz in Rochester. Only start times are listed, visit or call the venue for more details (the sites for many are in the right panel). Please forgive any discrepancies with reality and feel free to let me know what the problem is, and I'll get the corrections up on the site as soon as possible (click on the "Send an email to Jazz@Rochester" link). If you go out to hear a performance listed here, feel free to drop a comment to this post to let us know how it went. I want to hear from you! Live shots of Mostly Other People Do The Killing on stage tonight at The Bug Jar. With openers by locals Bitchin Kitchen and Bending & Breaking opening. Yes, jazz at The Bug Jar...whowouldathunkit? Sorry about the last one... there was some alcohol influenced issues that required me to replace it with the actual picture I meant to be here... it was a bit smaller, but not to diminish the band! Is jazz not "fun" enough for you? Do you expect to see it in a venue known for cutting edge music but with a more rock sensibility? Surprise!... unusual jazz will be presented in an unusual place when NY band Mostly Other People Do The Killing hit the stage at Rochester's The Bug Jar this Thursday, April 21st. MOPDTK Bassist Moppa Elliott has written that "[r]ather than settling into one style or historical period, MOPDTK fuses the entire spectrum of Jazz and the various forms of improvised music it has spawned into a single, seamless melange of Uber-Jass." While there is a lot of craziness and free(dom) in what they play, they are also well rooted in the traditions of jazz, similar to the way most of their album covers, like the This is Our Moosic cover here, nods back to Ornette Coleman (and all of them nod to one or another). While MOPDTK go for humor and mashup in their music, these guys are serious players with serious writing and playing chops. As Vern put it in the JazzWrap blog "...don't let their artwork and song titles fool you. Mostly Other People Do The Killing mean business and they do it quite well." While I've yet to see them live, which is how I like to experience jazz anyway (if you haven't guessed), what I've heard reminds me a lot of a band I saw (and one that apparently inspired them some) only a few weeks ago when Bop Arts presented the ICP Orchestra here. Their 2006 album Shamokin!!! 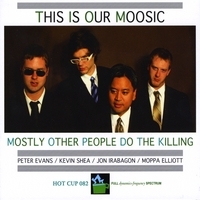 began getting them a lot of attention and in 2007 MOPDTK was nominated by the Jazz Journalists' Association for Small Ensemble of the Year and in 2009 won a DownBeat Critics' Poll in the Rising Star category. There is much more info on the band at MOPDTK's label, Hot Cup Records site, reviews of their 2011 debut Clean Feed CD The Cohimbra Concert (yes, that's a nod to Keith Jarrett...) on the Burning Ambulance and JazzWrap blogs. This is a great CD to check out if you want to hear them before the concert as it is a live album and, from what I"ve read, captures them well. Or you could check out the YouTube videos, like this one from Oslo in 2010 or this one (it's the first of several parts) from the Moers Jazz Festival. Lynne Arriale was fantastic on Saturday at Exodus to Jazz with her killing group of Omer Avital, Johnathan Blake and JD Allen (image). Other than Mr. Gordon with the RPO, we're all local this week. So here are the live jazz listings for the next seven days. Although I wish more of ROC had come to see this fine group of artists (Arriale's here with Omer Avital on bass, Johnathan Blake on drums, and JD Allen on saxophone), this is going to be a great 2 sets! The first of this evening's "two-fer". Ciacca is appearing with Mike Melito on drums and Dan Vitale on bass. Sponsored by XRIJF Executive Director Marc Iacona and his family who, with Nazareth College's Casa Italiana. While there is live jazz spread across the whole week, I'm focusing my limited time (day job is doggin me) on the two-fer of Antonio Ciacca and Lynne Arriale on Saturday. Unfortunately sans Misha who was feeling ill, the ICP (Instant Composer's Pool) bring a little craziness to the house... here again under the auspices of Tom Kohn & Bop Arts in the Physikos space @ Village Gate. Whether or not you caught Antonio Ciacca Trio earlier in the day at Naz, pianist Lynne Arriale makes a stop on her tour promoting a new Motema disc Convergence at Exodus To Jazz, 8:00 pm on April 9th at the Lutheran Church of the Reformation. She will be there with a killing group, joined by saxophonist JD Allen, Omer Avital on bass and Johnathan Blake on drums. Arriale was here last summer playing sets at the Xerox Auditorium during the 2010 International Jazz Festival. I enjoyed one of these trio sets and agree with JazzTimes reviewer who noted that Arriale "achieves a special, deep connection with her audience, and the energy flows both ways....[her] emotional authenticity allows her audience to feel and think along with her". The Lutheran Church of the Reformation is located at 111 N. Chestnut St, in downtown Rochester. There are three levels of tickets available. "Table ticket holders ($35) sit at round tables of five chairs, closest to the stage and the ticket includes free serving of food and beverage from the food concession at the concert. Ask for "Reserved Theatre" tickets ($25) to sit in the reserved section of theatre seats closest to the stage (however, individual seats in these areas are on a "first come, first seated" basis. "General Admission" ($20) ticket holders sit in the remaining areas of the main floor and the balcony. Tickets are available at all Wegmans stores and online at BrownPaperTickets.com. 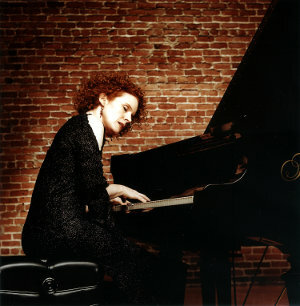 For concert information, visit Exodustojazz.com or call (585) 733-7685. Tickets are also available at the door when it opens at 7:00 pm. Parking is available at the church and nearby. For more on Arriale as an artist, check out Jason Crane's January interview on the JazzSession podcast. Two impressive jazz pianists who have previously graced the stage of the Xerox Rochester International Jazz Festival will be in Rochester on the same day next weekend, April 9th, and it will be possible to see them both if you have a mind to (I'm going to try....). 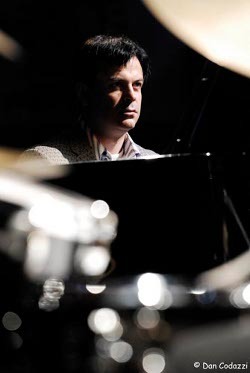 The first of this possible two-fer is being sponsored by XRIJF Executive Director & Co-Producer (and CEO of Simcona Electronics) Marc Iacona and his family who, with Nazareth College's Casa Italiana, are bringing composer and pianist Antonio Ciacca and his Trio to Rochester. Ciacca is currently the Director of Programming for Jazz at Lincoln Center and has worked with a wide range of artists, including Steve Lacy, Art Farmer, Lee Konitz, Wynton Marsalis, Dave Liebman, Benny Golson, Johnny Griffin, Joe Locke, Wess Anderson and Steve Grossman. 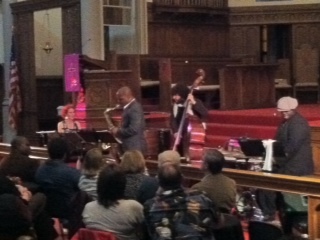 Ciacca has been to Rochester several times leading groups at the Jazz Festival. The concert will be held at 4:00 p.m. in the Wilmot Recital Hall on the Nazareth College campus. A light reception will follow. Tickets for adults are $25 per person; $35 with reception and opportunity to meet the musicians. Students free with valid id. Reservations can be made by calling the Casa Italiana at 585-389-2468. More event information here. Oh, yeah, the second will be Lynne Arriale, who brings her trio to the Exodus to Jazz stage the evening of the 9th.... More later on that.